Within the fast-moving controlled chaos of a basketball game, the players nonetheless enact definite roles. The number-five player is the center, perhaps the tallest and most prominent athlete (think Bill Russell, LL.D. ’07, Yao Ming): NBA fives patrol the baseline and the paint under the basket, rebounding, blocking shots, and often scoring dunks and layups. The power forward or four can score heavily from short or midrange positions and is strong enough to defend against other “bigs” (tall players, a.k.a. “trees”) down low—i.e., near the hoop. Kevin Garnett and Tim Duncan are fours. The small forward or three (Larry Bird, Julius Erving) is a versatile athlete who can handle the ball, spring a variety of offensive attacks, and often draws fouls, pouring in points from the free-throw line. The two or shooting guard, like Michael Jordan or Kobe Bryant, may be the team’s ace outside shooter and scorer; twos can also handle the ball well or drive to the net. Then there is the choreographer who directs basketball’s quintet: the number one or point guard (Magic Johnson, John Stockton), normally the team’s best dribbler, ball handler, and passer, as well as its shortest member. The one runs the offense and defense on the floor, as “an extension of the head coach,” as Brandyn Curry ’13 (’14) puts it. Doing this is “about control,” adds Siyani Chambers ’16. “Either the defense controls the offense, or the offense controls the defense.” Which way this falls will determine the outcome of the basketball game. 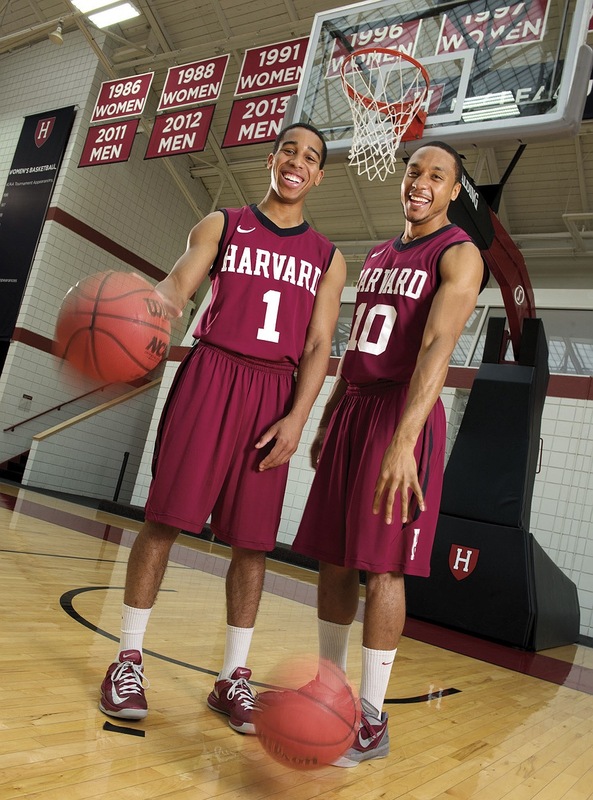 Curry and Chambers are two of the finest point guards in the college game. Curry returns this season, having taken a year off after being swept up in Harvard’s academic-misconduct scandal of last fall. He made the All-Ivy Second Team and was an Academic All-Ivy Leaguer as both a sophomore and junior. With 424 career assists, Curry is already sixth in Harvard’s record books; as a sophomore, he led the Ivies with 5.9 dishes per game. Last season, Chambers was not only Ivy League Rookie of the Year, but also became the first freshman ever named to the All-Ivy First Team. His 5.4 assists-per-game average led the Ancient Eight, and made him the nation’s top freshman in that category. Chambers also found time to score 13.7 points per contest, good for third in the league. (Wesley Saunders ’15 led the league with 17.1 points per Ivy game.) Harvard has won the last three Ivy League Championships, and last year captured its first NCAA tournament game. “You have to be comfortable telling other people what to do,” Chambers says. “And you’ve got to be vocal—very, very loud, so that everybody can hear you over a screaming crowd.” Curry adds, “You need to be mentally tough. Suppose you’re running a late-clock play [a set play that develops quickly, for use with little time on the shot clock] off an in-bounds pass. You’ve got to make sure everyone is in the right position, call the play, throw the pass, and when the shot goes up, get back on defense—you’re accountable for all that, and it all happens in 10 seconds. Or less.” Point guards also must manage their emotions: a point guard who’s having a poor game and begins to feel upset cannot start moping on the court, warns Chambers, as teammates will pick up the mood and team spirit will sag. “You set the tone,” he explains. In college basketball, 90 to 95 percent of the teams use man-to-man defense, meaning that each player guards a specific opponent, usually someone playing the same position—a three guarding another three, for example. (In zone defense, players defend an area of the court rather than a specific player.) The point guard communicates constantly (“You want a lot of chatter,” says Chambers), alerting teammates or giving commands. “Ball pressure!” or just “Ball!” urges close harassment of the ball handler: moving hands, arms, torso, and feet in ways that interfere with shots or passes. The related “Deny!” means to deny the ball handler the ability to pass, for example, by obstructing the potential passing lane. “Pick coming!” signals a defender that an opponent—usually a “big”— has positioned himself to screen, or block, the defender, “picking” him off the ball handler, and “Switch!” is a response to a successful pick: telling a teammate to switch off his man and guard the ball handler. The point guard initiates the transition game. “First thing is, you look up the court and see how many players they have back on defense,” Chambers explains. “If there’s only one or two back, we go for a primary break”—basketball’s classic “fast break,” whose goal is to get the ball up the court quickly for a layup or, failing that, foul shots. “If you see a big man streaking down the court, you’ll throw up a big lob pass or whatever to get the ball to him immediately. You want to reward the bigs for running hard.” With four or five defensive players back, the choice will be a secondary break—an offensive structure that enables an attack. Harvard, which likes up-tempo play, always strives to move the ball quickly up the court: “less dribbling, more passes” is the mantra.